What is the difference between PPC, SEO and Paid Inclusion? There is a big difference between natural or organic search engine optimization and pay-per-click (PPC), but many don’t know about it or don’t understand it. Organic is “free” traffic, in a sense. Organic’s only cost is the labor put in to optimizing your site. Pay-per-click traffic costs you labor plus the cost of a click. That is, you are charged each time someone clicks on your ad. 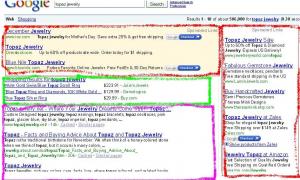 This shows the search results for a random term "topaz jewelry". The red areas are pay per click. The purple area is organic search. The green area (shopping results) is referred to as “paid inclusion”; it is managed through Google Base. This is usually managed by a feed. It is fairly cost effective, but you have very little control over when and where your products are shown.